For the marinade: In a large bowl, combine all the marinade ingredients. Whisk until well combined. Pour the marinade into a sealable bag. Add the chicken and refrigerate for 30 minutes to overnight. Coat a large skillet with cooking spray, heat over medium-high heat. Sear both sides of each chicken breast, add the water or chicken broth. Bring to a boil, reduce heat to a simmer, cover and cook for 15 minutes. Remove from liquid, allow to cool and shred. Reserve. For the pineapple relish: Heat the oil in a medium saucepan over medium heat, sauté the onions for 1 minute. Add the remaining relish ingredients except the cilantro. Bring to a boil, reduce to a simmer. Simmer for 15 minutes, stirring occasionally. Add the cilantro. Reserve. For the casserole: Combine the cornbread ingredients, whisk for 2 minutes. Stir in the reserved chicken and relish. Coat twelve 1-cup ramekins with cooking spray. Evenly divide the cornbread among the ramekins. Place on a baking sheet and bake for 20-25 minutes or until set. 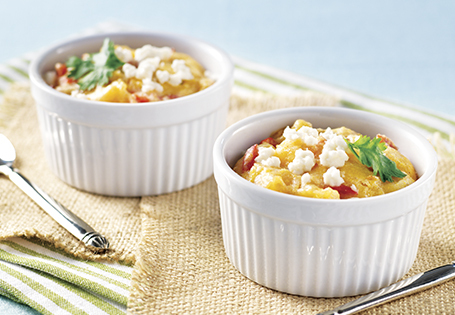 Optional: Garnish each casserole with 1 tablespoon crumbled fresco cheese and a sprig of cilantro.